Download the programme of events in Dublin here! With events on three continents, ATD will launch its global ‘Stop Poverty‘ campaign on 12 February, 2017. Declaring that poverty is not inevitable, the campaign highlights people living in extreme poverty as full partners in efforts to overcome it. The year long campaign will emphasises that the world can put a stop to poverty if people in all areas of society work together with the intention of leaving no one behind. Uteem was talking about Joseph Wresinski, founder of ATD, born 100 years ago on February 12 in a refugee camp in France. Having experienced extreme poverty as a child, Wresinski went on to found a movement of people living in similar conditions yet advocating for their rights and dignity. Expressing what he had learned first hand, Wresinski said, “It’s not so much food or clothing that these people need, but dignity and not to be dependent on other people’s goodwill.” In France, the Ministry of Culture has recognised Wresinski’s centenary as an official national commemoration. Throughout the year, Stop Poverty activities will take place around the world. 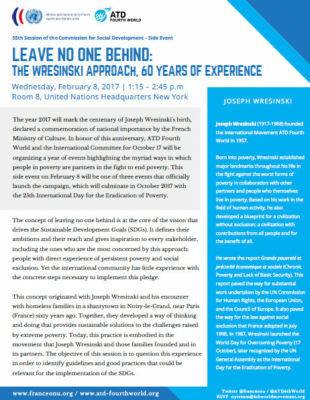 Launching the campaign will be a ceremony in Angers, France the birthplace of Joseph Wresinski, as well as a United Nations round table discussion broadcast live on Facebook here: Leave No One Behind: The Wresinski Approach. Additional events will take place at the University of Bangui in Central African Republic; the French Economic, Social and Environmental Council in Paris and at Brussells Place de la Bourse. In the United States, the resident choir of Trinity Episcopal Church in New Orleans will perform songs of dignity and struggle chosen by people living in poverty from around the world. is planed for Sunday 12th February! Save the Date! See below for more information about events overseas! Additional campaign activities throughout the year will include debates and conferences on how to include the voices of the poorest in the fight against poverty, an online call to action, and collecting stories of success in the fight to overcome poverty. The campaign will culminate with a number of special events on 17 October 2017, the 30th anniversary of the day which became the UN Day for the Eradication of Poverty. February 8, at the United Nations Headquarters in New York a side event will take place at the annual meeting of the General Assembly Commission on Social Development. This roundtable discussion will address the central concern of the new Sustainable Development Goals: who is left behind and why? Speakers will include: Francois Delattre, French Ambassador to the United Nations; Emma Speaks, ATD Fourth World activist; Christopher Winship, Professor of Sociology at Harvard University; Frédéric Viguier, Professor at New York University; and Genevieve Tardieu, Director of International Relations at ATD Fourth World. This event will be broadcast live on facebook. More about this event below. 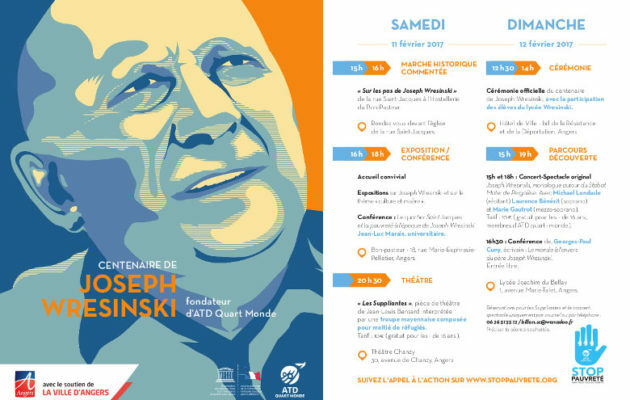 February 10, 11, & 12 in Angers, France, the birthplace of Joseph Wresinski, there will be a weekend of events, beginning with a ceremony at the town hall to recognize Joseph Wresinski alongside people living in poverty and others who work to support them. Isabelle Perrin, General Director of ATD Fourth World, and Christophe Bechu, Senator and Mayor of Angers, will launch the Stop Poverty: All Together in Dignity call to action. A walking tour will visit key sites of Joseph Wresinski’s childhood. In addition there will be theatrical performances, conferences, and a performance of “Joseph’s Monologue of the Stabat Mater of Pergolesi” by Michael Lonsdale, performed by Laurence Benezit, Soprano. See below for this event’s program in French. February 14, at the Economic, Environmental and Social Council in Paris, France, there will be a special session to highlight the international impact of the “Wresinski Report”, Chronic Poverty and Lack of Basic Security, on the fight against poverty in France. The session takes place on the 30th anniversary of the report’s publication. February 11, at the Titus Brandsma memorial in Nijmegen, the Netherlands, words from Joseph Wresinski chosen by hundreds of school children from across the country will be added to the Wall of Peace. Titus Brandsma was a Dutch priest sent to a concentration camp for speaking out against Nazism. February 11, ATD Fourth World Bangui, Central African Republic will host a roundtable discussion of the Wresinski approach to poverty with Maurice Guimendego, historian; Timoléon Kokongo, lawyer; Médard Sané, theologian; Eugen Brand, former Director General of ATD Fourth World; and the members of ATD Fourth World Central African Republic. The roundtable will begin with a performance of “Zo Kwe Zo” (Every Man Is a Man), a song which will be sung around the world throughout 2017 as part of the STOP Poverty campaign. February 12, in New Orleans USA, Trinity Episcopal Church will organize a concert including songs of resistance and dignity from 20 countries. This concert is one of the first in a series of musical performances that will take place in 2017 as part of an international choir partnership with the STOP Poverty campaign. In February, ATD Fourth World Latin America, in partnership with the University of Cuzco and the University of Mexico, will publish a book, authored jointly by intellectuals and people living in poverty, about the relevance of Joseph Wresinski’s writings for Latin America.